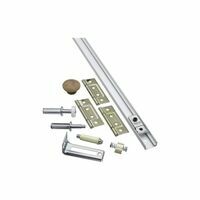 For door panels 1-1/8" to 1-3/4" thick, 18" x 108" wide, weighing up to 75 pounds per panel. Set contents: (1) 100 track length, (1) 107 top pivot set, (2) 1125 door hangers, (2) 1155 track stop, (6) 1606 hinges, (2) 1706 bottom pivot, (1) 1011 pivot bracket, (.5) 1808 door aligner, (1) 33 door knob, (1) - 1712 adjustment wrench. For door panels 1-1/8" to 1-3/4" thick, 18" x 108" wide, weighing up to 75 pounds per panel. Designed to carry heavy solid core doors. Patented "tricycle" hangers with large ball bearing wheels, ride smoothly and quietly on convex shaped rails with precision single point contact. 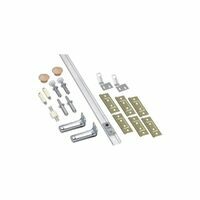 A quick disconnect clip system facilitating easy mounting or dismounting of door panels. 14 ? 16 gauge zinc trivalent plated steel parts. Set contents: (1) 100 track length, (2) 107 top pivot set, (1) 1125 door hangers, (1) 1155 track stop, (3) - 1606 hinges, (1) - 1706 bottom pivot, (2) 1011 pivot bracket, (1) 1808 door aligner, (2) - 33 door knob, (1) - 1712 adjustment wrench.